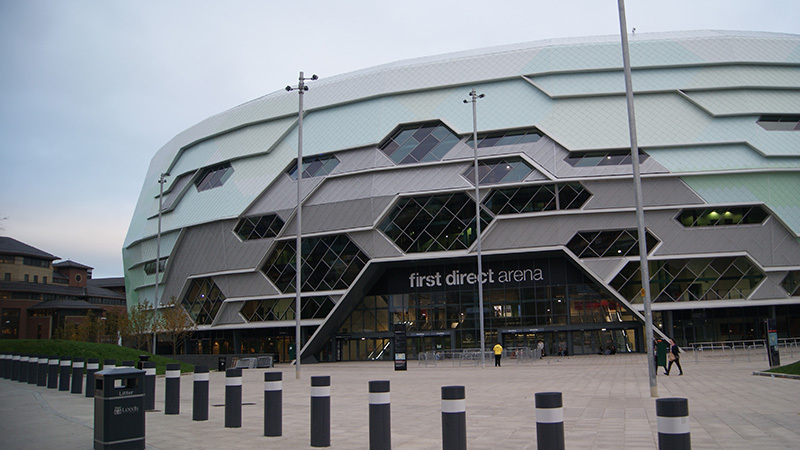 New to this year’s tour is the 13,500-seat First Direct Arena in Leeds, U.K. This month’s column completes last month’s (FOH, March 2018, page 39) list of agenda items for this winter’s off-the-road production dialog. This part includes the typical pre-tour, nuts-and-bolts bullet points that every production must address when actually getting the show back out on the road. This year, we are going out with the same show that was so successful last year. Yet every production, regardless of the number of trucks, seeks to become leaner and faster. It is often said, “It’s all about the load-out.” And the winter is the customary time for the brainstorming and streamlining discussions. The talks with production that occur often result in creating smoother days further down the road. Many of us have been out together for ten years or more so old habits and procedures may need occasional updating. Although our bodies aren’t on the bus, we are always working in our minds. Audio hopes to spend some time working out a better cable and equipment management system for the two stage right P.A. columns and the flown subs. In 2017, lighting and sound cables were too often competing for the same space — both in the air and on the ground. The sound department is suggesting that we relocate our cable bridge to help end this workflow issue. We would be happy to discuss any options, but I think moving the downstage end of our bridge truss offstage and more behind the flying subs could be a place to start. We would also like to relocate the stage right motor controller and the AC power distro to further avoid crossing paths with lighting and automation cabling. We then need to address the load-out sequence of events, so that stage right becomes less of a pinch point. Audio also hopes to discuss the sequence of rigging events for the stage left lighting and visual elements. Specifically, we are concerned about the pieces that hang independently from the main truss runs. On many occasions last year, it was not possible to set up monitor world in a timely manner. The master workflow plan had assigned flying those elements that impinge on monitor world’s floor space as the final rigging and flying tasks to be accomplished. There were circumstances last year when this job sequencing issue resulted in time crunch situations that were often unfair to stage audio, and consequently, to the musicians. Is it possible for us to mutually agree on a more beneficial tasking sequence when we encounter the more difficult rigging venues? Audio requests that we look into a potential issue occurring at the downstage left corner during load-out. Forking the tallest and heaviest pieces of equipment off that corner before monitor world is completely deconstructed or rolled away may help. One of these pieces falling on the monitor console is always a concern under the present plan. The audio department members who wire the stage have volunteered to reroute any cable runs that may have made using downstage center an unworkable option in the past. Let’s explore whether all departments can work together and minimize this potential for an unfortunate accident. We further suggest that the stage left P.A. cable bridge be extended all the way to the upstage left corner. The area around the stage left stairway has become a pinch point on both the load-in and load-out. Locating the stage left P.A. amp racks and cable caddies upstage of the stairs could alleviate much of the traffic jam. Clair Global has suggested we use the new, smaller and lighter weight Cohesion-10 boxes for the side two hangs. The proposed system would then be made up of 32 Cohesion-12 cabinets and 32 Cohesion-10 cabinets. Ground subs and flown subs will remain the same as last year. Clair also suggests using its new CP-6 self-powered frontfills. These dedicated boxes are smaller and lighter than the Cohesion-8s we used last year. Deploying self-powered units eliminates one amp rack on each side of the stage. The CP-6s travel with four in a case. We would carry two cases, giving us a total of eight available front fill boxes. As we did last year, we recommend the full system be flown on the first day at production rehearsals to ensure that all parts of the whole are meshing correctly. Getting the system in the air as soon as possible will give us the time and space to implement the previously noted rigging recommendations and allow us to respond immediately to any changing conditions. As was done last year, we hope that one full day at production rehearsals will be allotted to integrating our special guest and band into our production. Audio supports sending our Clair crew chief ahead to prep the duplicated audio system at our vendor’s facility in the U.K. Neither Monitors nor FOH foresee any situation arising that the remaining two Clair crew personnel could not successfully address. Will we be loading-in to the shed in Lenox on July 2 (evening before) or July 3 (day of show). Last year’s Tanglewood shows were excellent, and both performances were very well received — under the roof and out on the lawn. The mixing experience at FOH inside the venerable wooden shed has been improved year by year. Each wave of change initiated by SAVI to their installed audio system has raised the overall level of the concert experience in the audience seating areas and on the stage. FOH audio is pleased and grateful that the Boston Symphony Orchestra’s sound contractor has continued to improve the audience experience at this perennially challenging venue. I will verify with SAVI that last year’s system will be in place again for us this summer. Is there any room in the plan to air freight any audio gear from Lenox to the U.K.? Specifically, we may have to ship some of our more specialized microphones in order to exactly duplicate the U.S. stage setup in the U.K. and Ireland. Please advise if shipping from our tour inventory is possible, or if we should ask Clair to pre-ship duplicates to the U.K.
Our Clair crew chief will meet us in Manchester after spending three days at our U.K. sound vendor’s facility assembling and prepping our gear. Manchester is a U.S.-style arena with which we are familiar. Our U.S. arena system will be the model for this venue. Glasgow and Cardiff are smaller venues that we have also seen before. We anticipate no problems in deploying an optimal system in each. Leeds is a venue that is new for our tour. Judging from the photos, it bears a strong resemblance to the O2 in Dublin. The building website shows a seating capacity of 13,500. The stage is set under and behind a large proscenium opening. Like Dublin, the seating area is very wide; the vertical rise of the grandstand and balcony sections is quite steep. 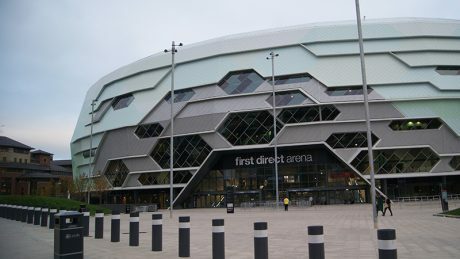 The full arena system (four columns of 16) as used in Manchester will also be required for Leeds. Please advise us when decisions have been made regarding audio gear that will be used in Italy. We hope that it will be possible to bring the FOH rig, monitor rig and stage gear from Cardiff, but we do understand that may not be possible given the distance, time constraints and any existing agreements with the Italian promoter. In the event that our gear is locally sourced, we request that our current consoles be exactly duplicated. We hope there is ample lead-time to procure both a DiGiCo SD5 for FOH and an Avid S6L for monitors. Once production details for the three Italian shows have been determined, please provide us with contact information for the Italian sound contractor. Putting our relevant issues in writing keeps the topics for pre-tour discussion at one’s fingertips. We should never allow a potential upgrade or positive workflow change to slip through the cracks during our extended periods of time off just because we forgot to write it down. Constructive and collaborative advance production planning with input from all departments produces a work environment in which individual crewmembers are able to concentrate more completely on their own specialties once rehearsals have begun. But after months of winter dialog, I am definitely ready to hit the road again in the spring.